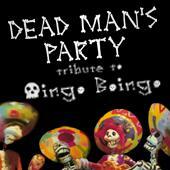 OINGO BOINGO/DANNY ELFMAN tribute band DEAD MAN'S PARTY returns to the IE for their 14th ANNUAL HALLOWEEN BASH! This show is ALL AGES! Online ticket sales end at 6:00 P.M. on Friday, October 31. Tickets can still be purchased at M15 Concert Bar & Gril after that point.